Love was the first motion, and then a concern arose that I might feel and understand their life and the spirit they lived in, if haply I might receive some instruction from them, or they in any degree helped forward by my following the leadings of Truth amongst them. The village is in the valley, the wadi; the Israeli town is much higher up. Low lying, the village of 1,200 people has abundant water—11 springs feeding numerous pools which then are used to irrigate the crops (The Israeli company, Mekerot, supplies drinking water). In use for over 800 years, USAID funds part of this. The village is known for its produce, specifically grapes, fruits, almonds and olive oil. Unfortunately because of its low elevation it also collects the pollution streaming from two settlements, plus Tsur Hadassah with its 4,200 residents. How much derives from Tsur Hadassah, I’m not sure. Two new settlements, Beitar Illit and Hadar Betar are part of a planned settlement block or city; they are causing part of the pollution in the wadi. Beitar Illit has already dried up two of Wadi Fukin’s spring. 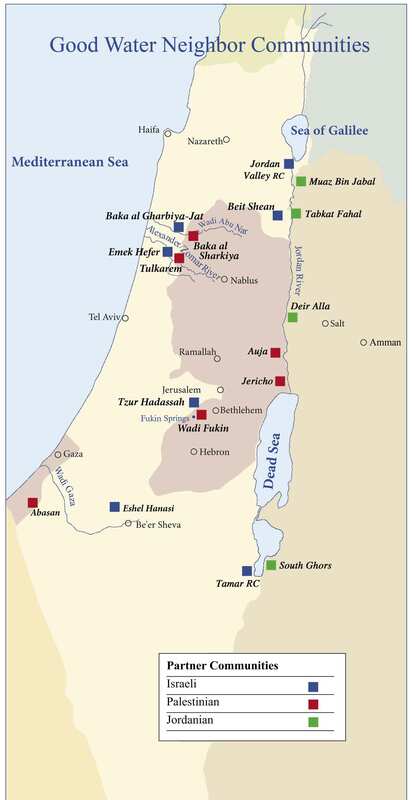 Wadi Fukin and Tsur Hadassah both resist the development of these new settlements. In addition the two neighbors also oppose the building of the separation fence between their towns. Quoting FoEME: Massive urban development, especially in Beitar Illit, has disrupted the feeding system for the springs, already drying up two of them. Soil and earth from the building process has been dumped over the slopes, covering much of the area, and occasionally wastewater from Beitar Illit flows into the fields, rending them unusable. Continued development is expected to worsen the damage. This unique landscape is being eaten away slowly. The contrast between Beitar Illit and the wadi is very clear. Reduction of the villages’ area—due to massive development in Beitar—has forced the residents of Wadi Fukin to build in the valley itself, as opposed to its slopes. The environmental damage…will continue to degrade the wadi and its springs: there are plans to build a highway through the village from the east, and the “Separation Barrier” from the west, encircling and virtually imprisoning the residents in their homes. These developments all threaten to destroy the wadi and its water sources—delivering a final death blow to the ancient agricultural methods and the cultural heritage on which it is based. 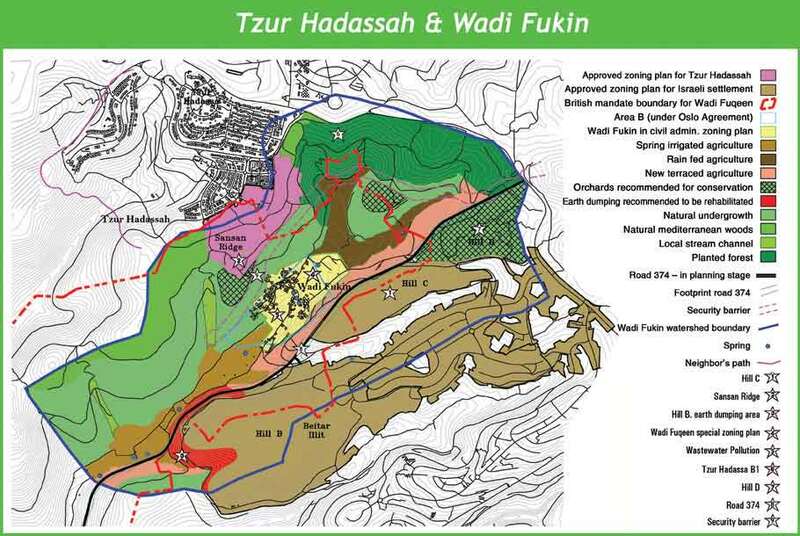 Future development plans for Tsur Hadassah also threaten to damage the wadi’s drainage basin. Many residents from Tsur Hadassah are active in environmental projects, and together with FoEME are promoting an environmentally sensitive approach for its continued development. The Neighbors Path was created in order to raise awareness, and importance, of the natural environment so close to home. That’s the context, as I understand it. Who were the participants of the field trip and subsequent daylong conference? Mayors in particular, and other officials from the communities, not only the two focused on but others throughout Israel, Palestine, and Jordan with similar projects. There are some 17projects in total, dating back to 2001.Wadi Fukin and Tsur Hadassah were among the earliest partners. I met public relations people from the communities, field workers, researchers, directors of projects, environmental experts, municipal officials, and the like. The Palestinian contingent did not arrive until late in our tour of the second site, Wadi Fukin. Because of heightened security provoked by the Annapolis talks, their permits came thru late. The invited participants from Gaza were, as expected, not allowed to leave Gaza. As the sun set and we reached the end of the road, local folks met us with sweets and coffee and tea. The idea of the paths is two fold: to bring local people onto the earth so they can better appreciate, understand and protect the environment, and, by connecting paths thru adjacent regions, to foster people to people contact across borders. The Tsur Hadassah path seemed finished, up and down hills, across hilltops, thru some of the most gorgeous and spacious land I’ve walked yet. I’m not sure whether the road we walked along in wadi Fukin was the path, and whether there was any connection yet with the Tsur Hadassah path. 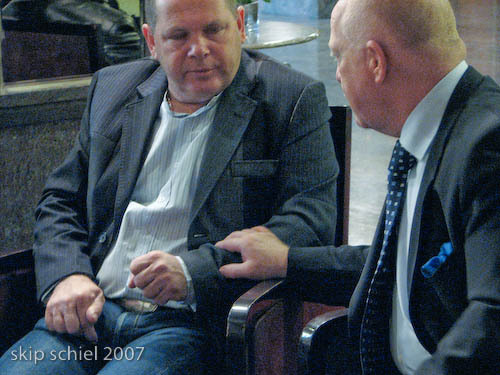 I observed disparate people chatting amiably together and tried to show this with my camera. How am I to know who is who? Except by language, skin color, and, if known, name? Most of the tour was narrated in Hebrew and Arabic, translating from one to the other, yet at times, when folks were conversing together and neither knew the other’s native language, they used English. I’m sure, because of my non-existent Hebrew and my severely limited Arabic, I missed much background information. Not listening allows me to more fully concentrate on the visual; not listening omits important perspectives. It is a mixed situation. Later an Israeli woman faulted me for my limited language ability. Following the tour, which was long and arduous, much driving in huge tour buses finally with sufficient legroom (even for some of my lankier friends), interspersed with food—snacks at a horse farm in or near Tsur Hadassah, lunch at the Fam, an Israeli restaurant and winery, and dinner at the Colony in Jerusalem, also Israeli. At the two Israeli restaurants I noticed the spirit of the communal pervaded the meals. Dessert, for instance: the waiter served a sweet gelatinous mixture resembling ice cream with various dressings. In one bowl: we each grabbed a portion with our own spoon. Same for the main courses, same for the salad. After a guided tour along the Old City ramparts in the dim evening light, most retired for the night to the Dan Panorama hotel in downtown Jerusalem while I stayed at the Golden Palm hostel in East Jerusalem. Meals and lodging, and the tour bus, must have cost enormous sums. FoEME paid for it all. I had to wonder, how much, and who funds FoEME? Primary donors are USAID, EU Partnership For Peace Program, the Richard and Rhoda Goldman Fund, and the British Government’s Global Opportunities Fund, along with the University of Miami, Florida International University, Global Nature Fund, Japan International Cooperation Agency and Embassy of Finland. Next day, the conference: mostly presentations in English about various projects hosted or supported by FoEME: ecological villages, workshops, partnerships, and the like. I photographed as well as I could, inspired by a few talks, notably by Dr. Howard Sumka, USAID West Bank/Gaza Mission Director, who offered heartfelt commendation of FoEME, and the moderator, Mungeth Mehyar, Friends of the Earth chair and Jordanian director, who I’d noticed earlier. Robust, frequently smiling genuinely, engaging with many folks, tanned, balding, he was appealing. Others speaking included Ramiro Cibrian Uzal, Ambassador of the EU delegation to Israel, Yael Shaltieli, Director General, Ministry of Agriculture, Israel, Raed Samara, head of the Joint Service Council for West Bethlehem, Seffi Hanegi, manager of Zman Midbar, an alternative tourism experience, and Ranya Hameid, from the Urtas folklore and cultural heritage center. Their names tell it all. All in one room, cooperating. For me the morning began with a luxurious hotel breakfast, more food than I could imagine eating, of many ethnicities. I sat with a woman from the Israeli kibbutz of Ein Geti, near the Dead Sea. A friend of hers from the same region told me the Ein Geti folks were about to meet with counterparts from Jordan, with whom they partner across the Dead Sea and what remains of the Jordan River. She told me she worked on the kibbutz’s botanical garden, breeding native plants. This was one of many environmental projects the kibbutz supports, some in conjunction with the neighboring Jordanians. Finding them in the relatively well lit hotel lobby, about 15 of them, Arabs and Jews sitting together amicably, I dropped by to photograph, this for me the major theme of the trip—cross border relations, a mean of bringing justice, fostering peace, path by path, step by step, person by person. One may ask however, is this normalization, the phenomena by which Good Water Neighbors and similar projects bringing adversarial groups together without emphasizing ending the occupation and addressing human rights’ issues is ineffective, charade and distraction, wrong, and ultimately curtails the struggle for justice? I’m mixed about this. Drawn to any efforts to link contending parties, I am naturally attracted to FoEME. At the same time, realizing the danger of this, I am wary. I honor the perspectives of many Palestinians I work with, the International Solitary Movement only one group, who believe this should be avoided. With one exception: personal relations. A Palestinian friend and fellow activist told me recently he has many Israeli friends; a group visited him recently in his village near the settlement of Ariel. Here, he said, I have no problem. Only when the relations become institutionalized would I reject such meetings. FoEME institutionalizes these personal relations, indeed, is devoted in large part to fostering them. Should I then avoid FoEME? A quandary. thanks for your yet again poetical reflection. a “non institutional gathering of friends of the earth middle east?” i like that idea. how would we do that? maybe a sort of “burning man” of activists? (if you’re familiar with burning man) or maybe a part of the great turning idea that joanna macey is promulgating. maybe we can discuss this sometime. I came across your photography by chance researching the Neighbors path, which I had become aware of through FOEME. I am at present planning a trip to the region to record large format landscapes around the proposed Red -Dead Sea conduit. I found your work inspiring and understood exactly what you mean, when you described making images when not distracted by conversation, people appear as one in the same, their cultural differences are beyond immediate visual representation. I worked for the Care organization in Latin America with very broken spanish and found that by being removed in one sense brought me closer in another. After recently completing my post grad, where I focussed toward environmental landscapes I became interested in the Dead sea Canal and how its preservation had become reduced to a feasibility study. My intention is to produce a series of images which on the surface may not reveal anything in a conventional documentary sense, but that refer to change, the tension held within the still image. How long has the Dead Sea! The Dead Sea’s future can be seen to symbolize global environmental concerns while at the same time represent the tension in the region. At present I am preparing an Art Council grant application, for my proposed visit. I decided to email you to ask your advice on traveling around the Holy lands. I am preparing a budget plan which is proving difficult with very little knowledge of the region. Any help which you may be able to provide would be greatly appreciated. Terrific internet site. I will come back soon.